Tarabish is a card game that is popular in Cape Breton. It is played with a regular deck of playing cards, but with some of the cards removed. The game is over when one or both teams accumulate 500 points or more. Points are counted at the end of each hand. Both teams always count their points and add to a running tally. The team with the most points at the end of the game wins. A Tarabish deck consists of a normal deck of playing cards with the 2 through 5 of each suit removed (if playing with 4). In preparation for the hand, the dealer shuffles the cards in the usual manner. When finished, the person to the right of the dealer cuts the cards. The cut must leave at least four cards in each portion of the deck. Once the cards have been cut, no further shuffling is allowed. The 36 Tarabish cards are dealt in groups of three beginning to the left of the dealer and proceeding clockwise until all the cards are passed out. The four players look at their first six cards prior to bidding. The last three, called the kitty, remain face down until after the bid is complete and a trump suit has been chosen. When playing with 2 or 3 players, the 6 and 7 are also removed from the deck. In all cases, players are dealt 9 cards (6 to bid with, 3 in the kitty). Each player competes on their own and must score more points than any other one player. The game concludes when one or more players reach 500. When dealing, one card is turned face up in the middle of the table after dealing the first 6 cards and before dealing the kitty. Players must first decide - in succession and starting to the left of the dealer - if they wish to make a bid based upon the suit of the upturned card. If not, the player says "pass" and the person to their left then has the option. If all 3 players pass on the upturned suit, the players (in succession) then have the option to make a bid on any of the other 3 suits remaining. If all pass again, the hand is thrown in and the cards pass to the next dealer (unless the hand is forced). 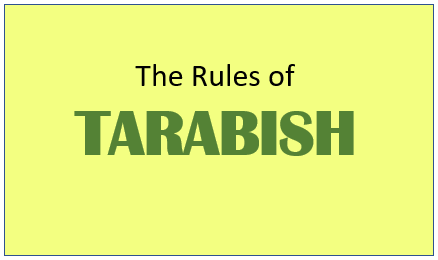 Note: In 2 handed Tarabish, there are 9 cards that are not dealt and are therefore not in play. They are left hidden and face-down on the table. The bid is the process of determining the trump suit for the hand. The player to the left of the dealer has the first option of choosing the trump suit. If they pass, the decision passes to the next person and so on. In the most popular variation, if the bid passes to the dealer, the dealer is forced to choose a trump suit. The less popular variation allows the dealer to pass in which case the hand is complete and the deal passes to the next player. The team that bids must accumulate more than half of the points for that hand. If they get less than half, it is termed a bate and their points go to their opponents. If they get exactly half the points it is termed half-bate, in which case they count zero while their opponents of get to keep their own points. Play begins with the player to the left of the dealer and proceeds clockwise until each player has played a card. Each player must follow suit by playing a card of the same suit as the card led in each trick. If you don't have a card of the same suit, you must play a trump if you have one. If you don't have a trump you can discard anything. Any time you play a trump, you must play to beat any other trumps on the trick, if you can. The person with the highest card on the trick collects the cards and makes the first play for the next trick. When you collect tricks, it is important to keep them neat, as they may need to be referred to in the event of a misplay. Completed tricks must be kept face down. You may suspend play at any time and ask to see the last completed trick, but none before it. Once a trick is turned over it is considered complete. Failure to comply with the rules outlined in the preceding sections is called a ‘’misplay.’’ If you suspect someone has misplayed, you can stop the hand by calling "misplay.’’ You must then prove it by examining the over-turned tricks and identifying the trick where the misplay occurred. 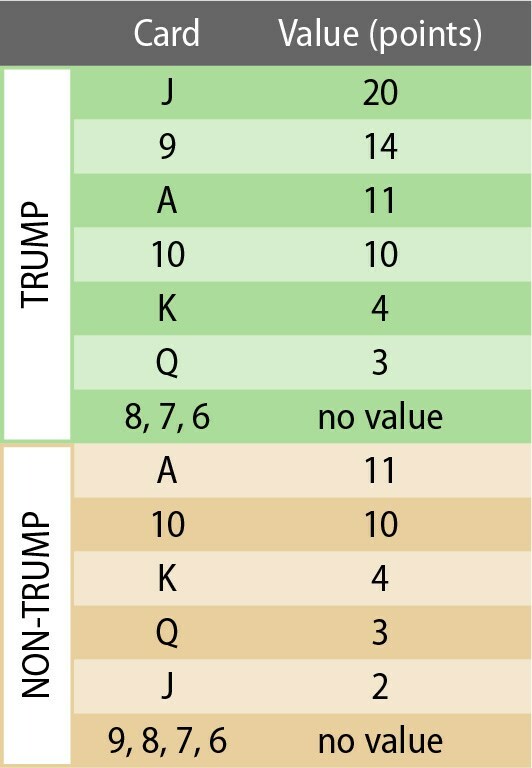 As an example, consider a trick where the King of trump is led, and the second player places a 6 of trump on the trick. If later the second player plays the 9 of trump, a good tarabish player will remember that the second player didn't beat the King on the earlier trick, and call "misplay." If you are successful in proving the misplay, your team gets all of the points for the hand. If however, if you cannot prove the misplay, your opponents get all the points. At any time a player may throw his cards and forfeit the points that have been played. Upon completion of each hand, teams count the points of the cards in the tricks they have won. Base score for a hand is 162 points, if there are no runs (melds) or "Bella" in the hand. (See below.) This is derived from 62 points in trump values, 90 points in non trump values, and 10 points for taking the last trick. The bidding team must score at least one more point than the opposing team (82 by default), otherwise they are considered bate and all points are awarded to the non-bidding team. The highest possible score for a team in 1 hand is 282 (2 "50's" and Bella), since only the highest straight is counted, but a single player can have more than 1 straight if their hand contains the highest straight among players. There are two types of runs. Runs in tarabish are according to the customary card rank as in Poker (6, 7, 8, 9, 10, J, Q, K, A). So the three best trumps (J, 9, A) do not make a run. A fifty is a run similar to a twenty, however it is a run of four cards in a row. If you happen to have 5 or 6 cards in a row it is still considered a fifty, and the extra cards are in no way significant when comparing to other runs. A player with a run must announce to the other players that they have a run before they play their first card. A player must show their run immediately before playing their second card. A fifty always beats a twenty. When comparing two runs of the same size, the one with the highest rank (top card) is best. A run in trumps beats a run of the same size and rank in non-trumps. Two runs of the same size and rank in non-trumps cancel each other out. In this case no one counts their runs, even if one player has multiple runs. If a player announces a run, but fails to show it before the play of their second card, the run is not counted. Bella (or Bells) is when a player has the King and Queen of the trump suit, and is worth an additional 20 points when called. The player MUST call bella when playing the last of the 2 cards to get the points. Common practice allows to instead call the first of the bells rather than the last. This is advantageous in remembering to call it, but gives others information about one's hand and may be detrimental in giving away points if going bate. Official rules state that calling "first of bells" is table-talk and an automatic forfeiture of points since it is telling your partner of another guaranteed trump you have in your hand. In the event that bella is part of a valid run, the player has the option to announce "Bella" when they show their run or wait until played. Bate - The team which "calls" trump and fails to accumulate at least one point more than half the points available. Half Bate - The team which "calls" trump accumulates exactly half the available points. The calling team receives a score of zero, the non-calling team receives full credit for their score (1/2 of the total score of the hand). Bella - When a player has the King and Queen of trump. Run - Three or four cards in sequence in the same suit. Twenty - A run of three cards. Fifty - A run of four cards. Misplay or renege - When a player doesn't follow the lead suit, or doesn't beat trump when he can. If a misplay is called against a team, all the points go to the team who called the misplay. Last - Winning the last trick in a hand earns an additional 10 points. Kitty - The three cards that are hidden to a player until after trump is called. Playing to beat - If at any time a player is forced to play a trump, he must beat the best trump card on the table. 50 with the Bells - Calling and showing a 3 or 4-card run that includes the king and queen of trump (bella). Dry Ten - When a player has only the 10 in a suit, after being dealt their cards. Forced - A popular variation. If a team has over 400 points, that team is forced to call trump. Therefore, they are not allowed to pass trump call to the dealer if the dealer is on the opposite team. If both teams are over 400 points, the team with the higher points is 'forced'.